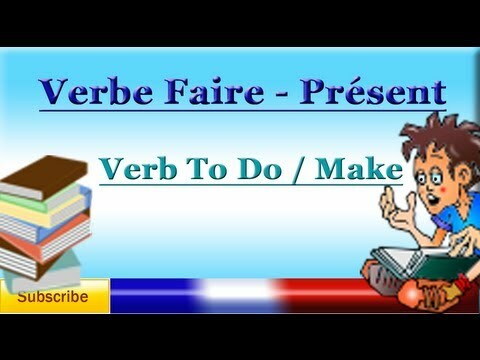 The verb faire (to make/do) is irregular (it doesn't conjugate the same way as most verbs ending in -re). Note that nous faisons sounds like "fesons"
Je fais toujours mon lit. I always make my bed. Mon amie fait ses propres bijoux. My friend makes her own jewellery. We are making a cake. Vous faites tous vos devoirs? Are you all doing your homework? Les enfants font un château de sable. The children are making a sandcastle. Do you have a question Akanksh? how are you all babes? 1. What is the purpose of the word "tous" in this sentence? 2. Why is the "s" in "tous" pronounced before the " v" in "vos"? Oops, I see an answer to my questions, I think, for Max. irregular? It sounds like 'fesons' (the 'ai' is not pronounced as in 'il fait' or 'vous faites'). The "ai" in "faisons" should be pronounced like the "ai" in "faites". You can go to the Google translator, choose French as the language and enter "faisons", then click on the litlle loudspeaker icon and hear it pronounced for you. -- Chris (not a native speaker). Merci pour votre réponse, Claus. To me faisons sounds like fesons (not like fésons) I found this on a blog: The standard pronunciation of faisons is indeed [fəzɔ̃]... And this explanation at https://leconjugueur.lefigaro.fr/conjugaison/verbe/faire.html Règle du verbe faire: Même si on écrit, nous faisons, on le prononce comme nous fesons. So, I was wondering about such an unusual pronunciation. Oui, tu as peut-être raison. Cettes différences sont difficile à partager par un message écrit. Quand je dis "faisons" de voix haute ça sonne plus comme f"é"sons. --Chris. So the answer is that faisons is a very weird case in French, as it is indeed pronounced "fesons". I meant to say "fesait" above. Since people pointed out that faisait/feson and other conjugations of faire share this pronunciation in French from France. Regarding the example, "Vous faites tous vos devoirs? ", instead of "Are you all doing your homework? ", I'd have thought the translation would be "Are you doing all your homework?". Could it not be? Thanks! - but if you pronounced [too] with a mute h, then the "tous" would go with "vos devoirs"and would mean = "all your homework". Bonjour Marilyn ! I'm afraid your sentence makes little sense in French... what did you mean here? I'd be happy to help! À bientôt ! is the audio for :Vous faites tous vos devoirs? correct? On ne prononce pas le "s" in le mot"tous" , n'est pas? Actually, in this case, you do pronounce [tooss]. Indeed, when tous is used on its own, meaning "all" (or in front of a vowel), you will pronounce the "s", as it is the case here "Vous faites tous vos devoirs." (You're all doing your homework.). However, I understand the trickiness here, as this French sentence could also mean "You're doing all (of) your homework", in which case tous goes with vos devoirs, and should then be pronounced [too] with a silent "s". How would you say "are you doing all your homework?" Bonjour Evan ! You could say: "Tu fais tous tes devoirs ?" "Est-ce que tu fais tous tes devoirs ?" "Fais-tu tous tes devoirs ?" À bientôt ! So how does it differ from "Vous faites tous vos devoirs?" (Are you * all * doing your homework?) other than vows instead of tu ? So how does it differ from "Vous faites tous vos devoirs?" (Are you * all * doing your homework?) other than vous instead of tu ? That's a great question ! In writing form, it doesn't differ at all, as you could also use "vous" in the polite form for one person. However, the pronunciation of "tous" does change! Indeed, in "tous vos devoirs" (all your homework), the "s" in "tous" is silent, whereas in "vous faites tous" (you're all doing), you will pronounce [tooss]! I hope that's helpful! À bientôt ! Check audio for 'Tu fais du sport?'. Does not seem correct. Bonjour Hoyt ! We've now regenerated this audio example, please have a listen: https://french.kwiziq.com/my-languages/french/view/408 Merci et à bientôt ! Can you explain why there is "du" in this sentence: "Tu fais du mieux que tu peux" (You do the best you can). It's from a quiz. I also noticed "Elle fait de la natation". I'm assuming that there's a 'de" after faire when it comes to sports?